Advocates against gay conversion therapy have recently been winning victories here and abroad, even as fear mounts about the Trump-Pence administration rolling back LGBTQ advances in the U.S.
Malta became the first European nation to criminalize the practice last week via national legislation approved by its Parliament, prohibiting the pathologization of any sexual orientation, gender identity, or gender expression, according to the New York Times. The second act focused on gender identity and the rights of transgender people. It lowered the age at which people can change their gender on government documents without the consent of a parent or guardian to 16 from 18. The measures were supported by organizations including the Malta Chamber of Psychologists, The Maltese Association of Psychiatry, The Malta Association of Family Therapy & Systemic Practice, as well as the Malta Association for the Counseling Profession, according to Malta Today. The Catholic country, a member of the European Union, has long been supportive of gay and transgender rights. 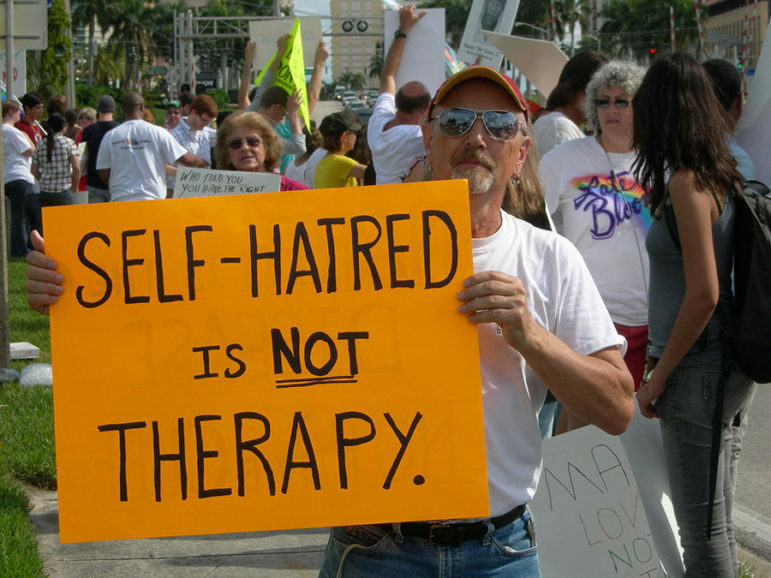 As the New York Times points out, conversion therapy has become a topic du jour with the election of Donald Trump and his running mate, Mike Pence. Trump hasn’t taken a specific stand on the issue but has been opposed to marriage equality legislation. Pence has been accused of tacitly supporting conversion therapy, in part based on the following sentence that appeared in the 2016 Republican Party platform: “We support the right of parents to determine the proper medical treatment and therapy for their minor children.” Pence denies that claim. Human rights groups remain wary. Stateside, as recently as Tuesday, a major national city also took a stand against the practice, joining more than a dozen American cities and states banning conversion therapy, including New Jersey, where a judge ordered a gay conversion nonprofit to close last year. The Pittsburgh City Council voted this week to ban conversion therapy for minors, the Patriot-News reported online, specifically in response to the election of Donald Trump. Supporters of LGBTQ rights also gained momentum following the narrow loss of North Carolina Republican Governor Pat McCrory at the polls in November after he helped enact the infamous HB2 bill that restricted rights for people who identify as lesbian, gay, bisexual, transgender or queer. Over the last 15 years, lawmakers and school administrators have increasingly recognized that LGBT youth are a vulnerable population in school settings, and many have implemented policies designed to ensure all students feel safe and welcome at school. Yet progress is uneven. In many states and school districts, LGBT students and teachers lack protections from discrimination on the basis of sexual orientation or gender identity. In others, protections that do exist are inadequate or unenforced. As transgender and gender non-conforming students have become more visible, too, many states and school districts have ignored their needs and failed to ensure they enjoy the same academic and extracurricular benefits as their non-transgender peers.